Volunteer with the Amazing Women of VLSCS! Volunteer for a day! Volunteer all year round! Picture yourself fitting in! The Victoria Lesbian Seniors Care Society depends on volunteers of all ages. And hundreds of amazing women have volunteered to make VLSCS programs and events happen! Everything from public education and social action to washing up after a Friday night social, our volunteers go above and beyond, below and in the corners, to help ensure safe, accessible, welcoming spaces for lesbians. Is it your time to take a turn at the wheel? 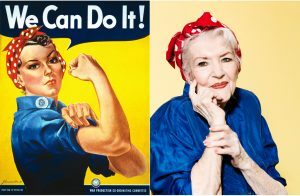 Fire up the riveter? Flex your pecs? Our Web Team needs assistance. Writing, editing, page design, WordPress skills are an asset, but if you are willing to learn, we are willing to teach! Are you a political animal or a party animal? The VLSCS Public Education and Social Action Team needs both of you. Learn the true meaning of party politics at fundraisers, round tables, meet and greets, and mixers. Find out who’s who and what’s what under the rainbow. Try to make the world a happy place for everyone! Too many opportunities to list them all. What’s your passion? Is there something you’ve always wanted to do but never got a chance to? What are you best at? What would you like to gain experience at? Write us, call us, come to an event—let’s find a fit for you!